Among the several kinds of spirits on Kitas, dead spirits are the most common "artificial" ones. 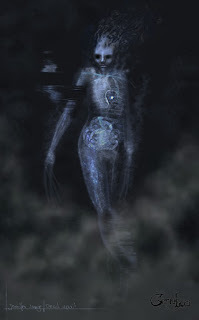 Dead spirits come into being from people dying under bad circumstances - murder, intense pain of mind or body, while obsessed with one thought, from incorrect or missing burial rituals - or simply because they believe they must become spirits. Dead spirits are wrathful and insane. They are obsessed with getting justice and will leave when they get it - which may be as easy as setting up a tombstone. In harder cases, spirit collectors are called. Dead spirits have the general shape of their former self, but strangely dislocated in places, with bones shining through and a clearly visible dark heart. Only powerful spirits can attack, but their presence always causes discomfort or damage - from headaches to heart attacks. All dead spirits will attempt possession. Ghosts and haunted places were among my favourite stories as a child, from poltergeists to banshees, Wiedergänger, Aufsitzer... the dead spirits of Genius Loci have many of those powers. They are not helpful at all, not to be trifled with, and can be encountered anywhere, which should be a lot of fun in stories to come. Darkhearts are powerful enemies of freedom, and therefore the dark heart suited the dead very well (I am very glad I had this idea).